Pomaire is a typical small village of Central Chile, rich in craftsmanship and culinary tradition. Its population is of 10,000 inhabitants and is located in the Commune of Melipilla, 50 km. West of Santiago. Access is via Ruta 78, motorway also known as Autopista del Sol. The place is well known among Chileans, for being a very traditional place and its proximity to Santiago, the capital, but for the majority of the foreign tourists, Pomaire is still a place to discover. Since ancient times, clay pottery has made this village famous, surrounded by hills that have provided the necessary raw material for centuries, this has been the main activity since before the arrival of the Spaniards. Along its main streets are the workshops where thousands of artifacts are manufactured and offered. 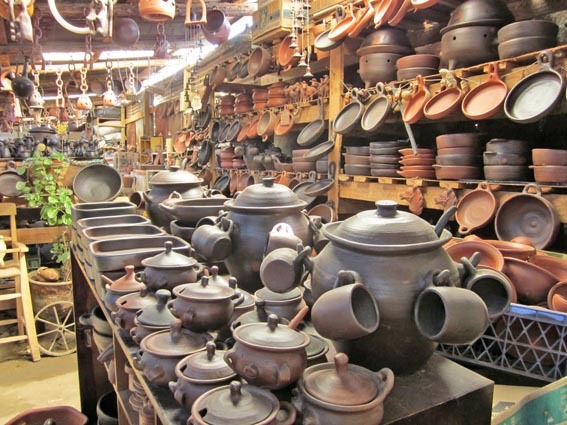 Many are the shapes that can be modeled with this noble material, from large "cántaros" (jugs), cookware, dishes, flowerpots, to small "chanchitos de greda" (clay piggy banks), which constitute an excellent souvenir, anyway you can choose from a variety of shops and prices. But Pomaire is not only known for its handicrafts, it also offers a rich typical cuisine, with "cazuelas" (hen or beef soups), Chilean "empanadas", "arrollado" (meat roll), "perniles" (pork leg), "pastel de choclo" (corn pie) and also the yummy "humitas" as its most famous exponents. Just like the main streets of the town, Roberto Bravo and San Antonio are full with pottery shops, restaurants also abound here, which compete with each other to attract the diners.